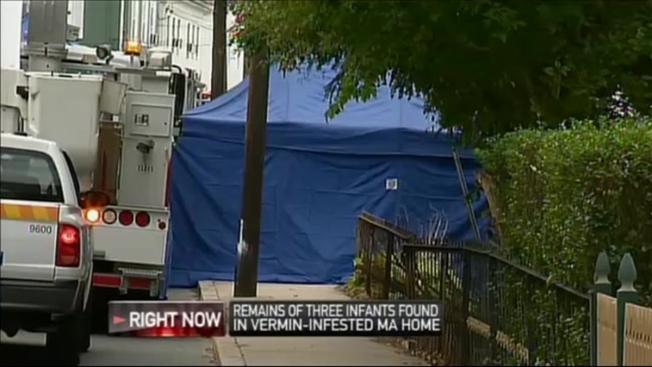 Authorities say a woman who lived at a squalid Massachusetts home where the bodies of three infants were found among vermin and piles of soiled diapers is facing charges including fetal death concealment. Detectives investigating a case of reckless endangerment of children found the bodies this week at the house in Blackstone. Four other children were removed from the home two weeks earlier. Thirty-one-year-old Erika Murray was arrested Thursday night and faces arraignment Friday. It's not immediately known if she has an attorney. Police say Murray is the mother of the two oldest children removed from the home last month, but no birth records existed for the two youngest. Police found the body of a dead infant in a closet on Wednesday. Two more dead infants were found Thursday.